This episode - one of the best in all four seasons of Game Of Thrones - will be remembered for its gruesome conclusion. And rightly so. Seeing a man having his skull crushed like a ripe melon is a haunting image, one you're unlikely to see in many other TV shows. 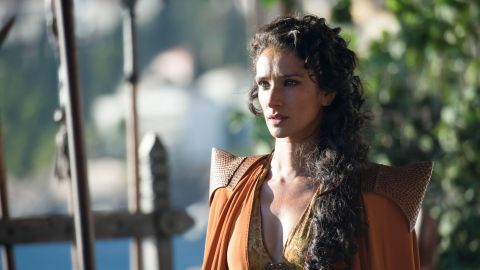 And while GOT has built a reputation for graphic violence, it's still enough to shock long-term fans. The shock isn't entirely down to the gore itself, though. The savage, cruel nature of man is a theme for the whole episode (again, nothing new for GOT, but it's handled particularly well here), and the bloody conclusion - while surprising enough to make viewers physically recoil - is the only fitting end to such a carefully considered build up. It starts with Tyrion's chat with Jamie inside his prison cell, where the two share a tender moment discussing the potential outcome of the fight. Conversation quickly moves to talk of Orson Lannister, a simple relative who spent his days crushing beetles with a rock. Tyrion explains how he struggled to understand Orson's behaviour at the time, but it become obvious that - during his incarceration - he's solved the puzzle. Tyrion's trial by combat is settled between Prince Oberyn 'The Red Viper' and Gregor 'The Mountain' Clegaine in suitably bloody fashion. In the north, Ramsey Snow butchers the Ironborn at Moat Cailin using Theon as a decoy, and in the Vale Baelish and Sansa cover up the murder of Lysa. Across the sea, Denarys discovered Ser Jorah was a spy for Lord Varys. In typical fashion, too, “The Mountain and the Viper” takes great delight in breaking the heart of its audience. It builds Prince Oberyn's victory to fever pitch before literally crushing it to a pulp. As viewers, we see the catastrophic folly of Oberyn's hubris far too late to fully contemplate the consequences before they happen. Similarly, we see the exile of Ser Jorah from Denarys (the longest existing partnership on the show), a reminder that you can't escape your past in this harsh story. And then there's Theon / Reek. While it's certainly heartbreaking to see the tragic shell Theon has become, it's still unclear whether or not the unthinkable torture has truly broken him. The directors definitely want to leave it ambiguous, to give viewers the glimmer of hope that Theon has retained some humanity in the face of such brutality. He's suffered enough for most to forgive his confused, reckless past. Again, his story could be one of redemption (much like Jamie Lannister) and he could join the weak and the crippled as the 'winners' of Game Of Thrones. If so, he's playing a very, very long game.